The Philippines played host to a major Tekken 7 event this past weekend, allowing local competitors to try their skills against two of the world’s strongest players. South Korean masters Hyun-jin “JDCR” Kim and Jin-woo “Saint” Choi stopped in the city of Makati for the Rage Art tournament after placing first and second, respectively, at Combo Breaker in the United States. Saint’s status on the world stage, however, was put in jeopardy by an unlikely local. Thanks to his victory at The King of Iron Fist Tournament 2016, Saint is the undisputed champion of Tekken 7. His mastery of the series has led to multiple tournament wins since the latest installment first launched in arcades in 2015, but that doesn’t mean he’s unbeatable. While periodic losses to fellow Tekken masters JDCR and Nakayama “Nobi” Daichi can be expected, being eliminated by a player with much less global recognition turned heads in Makati. Filipino competitor Andreij “Doujin” Albar is well-known within his local community. Doujin barely missed out on earning a trip to Japan for The King of Iron Fist Tournament last year after losing to Tekken prodigy Alexandre “AK” Laverez, but previous showings at events like Singapore’s South East Asia Major have cemented him as one of the Philippines’ strongest players. 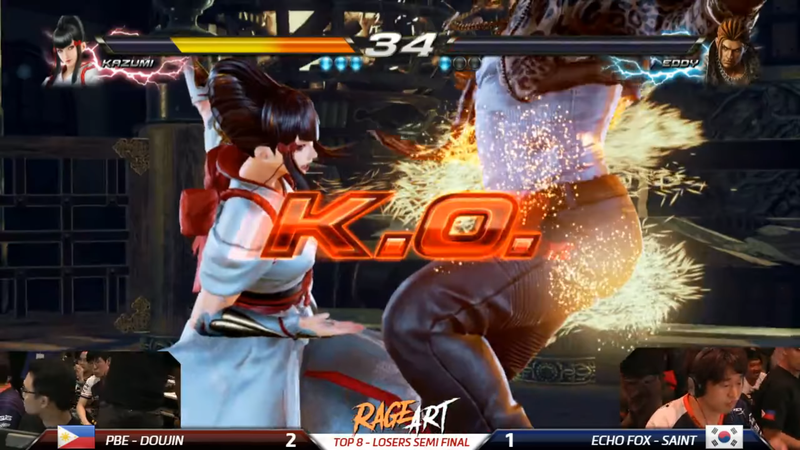 As Rage Art got under way on June 3, Doujin was immediately sent to the losers bracket with a loss to fellow Filipino competitor Jeff “Coffee_Prinz” Gonzales. The world champ, Saint, joined him there in the next round thanks to an unfortunate matchup against JDCR. Undeterred, both players fought through elimination matches, and after defeating Coffee_Prinz in the runback, Doujin found himself staring down the prospect of facing Saint. The set started out with an interesting mirror match as Doujin decided to see how his Jack-7 stacked up against Saint’s. The robotic fighter has seen successive appearances in almost every Tekken installment since the franchise began in 1994, and Saint has used the latest iteration successfully at numerous Tekken 7 events. Even with the entire crowd behind him, Doujin’s gamble failed, and he found himself down one game to Saint. WalkeDespite taking Saint down the wire, Doujin showed little hesitation in returning to the character select screen, shifting back to Kazumi Mishima, the tiger-wielding mother that carried him throughout the rest of the tournament. That’s when things took a turn. The slight advantage he enjoyed in the Jack-7 mirror dissipated, and Doujin took a commanding victory after three dominating rounds. Saint used the opportunity to switch to his other main character, Dragunov, who sits much higher on most of the accepted Tekken 7 tier lists. The commentators noted that this was the first time Saint chose Dragunov throughout the entire tournament, but his familiarity with the character did little to staunch the bleeding as Doujin picked up another convincing win. As the Filipino crowd cheered for their hometown hero, Saint pulled a trump card in the form of Eddy Gordo. A perennial thorn in the side of many Tekken competitors, Eddie’s moves have been hard to pin down throughout the series’ history, and it’s likely Saint was trying to exploit any unfamiliarity Doujin may have fighting the character. Unfortunately for him, the local commentator noted that Eddy is super popular in the Philippines, meaning Doujin has had experience playing against him in other games, if not specifically Tekken 7 due to his recent debut in the console version. But, to the delight of the spectators, Doujin showed no signs of slowing down, dropping just one round to Saint en route to his third win, the deciding game of their set. In the fighting game community, some global regions receive more attention than others. Players in Japan, the United States, and Europe can expect a good amount of shine for their competitive achievements that varies from game to game. This makes any deviation from the norm, such as a relatively unknown player taking down one of the greats, an exciting prospect, especially when that player hails from a region that isn’t known for producing prodigious talent. In this way, Doujin’s personal victory over Saint was also a point of regional pride for his fellow Filipino players, and the crowd showed their respect by chanting his name. Doujin would go on to defeat AK, the young player who qualified for last year’s world championships, and earn the right to face JDCR in the grand finals. He had another strong showing against the visiting opponent, but Doujin ultimately succumbed to JDCR’s measured prowess, securing a second-place finish for his home country in the process. But why Tekken? In recent years, players in the Philippines have made a name for themselves competing in games like Tekken Tag Tournament 2 and now Tekken 7, forcing some of the world’s strongest competitors to reevaluate their gameplay when facing the island nation. Co also noted that Bandai Namco supported competition in the Philippines in the late 2000s through the country’s largest arcade chain, Timezone. While the franchise’s popularity was already well-established by that point, the help the community received from the developers meant that players were more likely to stick with Tekken, cultivating skill in the process. Tekken’s longer match structure, despite its generally fast-paced gameplay, also had a hand in making it popular in the Philippines, as players felt they were getting more for their money. “This is also why arcade operators changed Marvel vs. Capcom 2 to the lowest damage setting, which is partly the reason why you’re writing about Filipinos doing well in international Tekken competition, not Marvel,” he added. Doujin’s victory over Saint, while small on its surface, is a sign that Tekken skill is no longer confined to just a handful of countries. Building off the accomplishments AK earned around the world over the past few years, Rage Art was a beautiful sort of coming out party for the Filipino community, showcasing the strides they have made and further expanding the world of Tekken for its competitors. For more Tekken 7 action from Rage Art, check out the full finals archive courtesy of broadcaster Team Spooky.